I think they're the twin fawns who graced our farm last spring and summer, hugging their mama's side and growing like weeds. We had a hard winter for western Washington and I'm glad to see them back, safe and sound. Well....they were a little rough around the edges. Harsh, wiry winter coats are coming off with a vengeance providing nesting material for the barn swallows. No worries 'bout the ribbiness....there's plenty of grass and young shoots to browse. Soon Mama will leave these little guys behind to fend for themselves. If they were good students they'll have all the skills they need to "make it" in a big buck's world. Mama looks like she'll be pretty busy teaching another little one pretty soon...and those rough looking characters in the pasture won't be "Mama's Boys" anymore. So...what's a guy to do when swim suit season is coming and you have, uh, a "little" weight to take off? 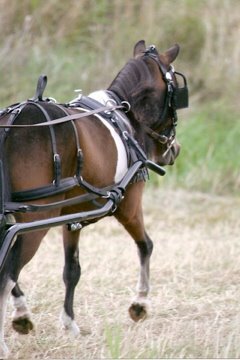 Folks who have miniature horses have a saying: "Minis gain weight on AIR!". It is very safe to say minis are very easy keepers. That brings us to "Quaker" (Mountain Meadows Quaker 6.8). 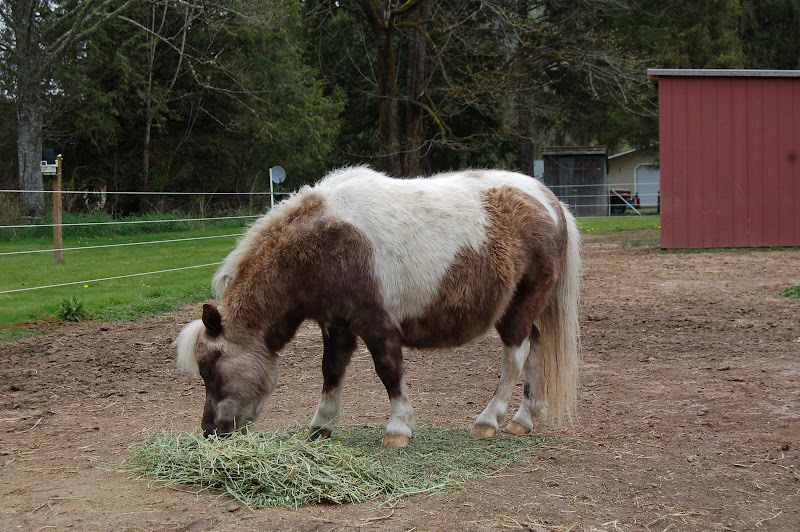 Quaker was born very shortly after the Nisqually earthquake on February 28, 2002. His mama said something like, "This ground is arockin' and arollin' -- no WAY is this baby staying inside!" And so Quaker was born. Tell me, have you ever met a horse with a Richter scale reading in his name? Today was the start of Quaker's weight loss program. First came the vital statistics: heart girth 45 inches, height at the withers (where the neck attaches to the back, kinda) 32 1/4 inches, body length from point of shoulder to point of buttocks 37 inches. Check, check and double check. Add the measurements to a way-cool spreadsheet and presto-chango, Quaker comes up weighing 213 pounds. Sounds pretty tiny, right? Nope. He needs to weigh LESS! Second comes the new pasture arrangement. This means not being out with his buddies in the big grassy pasture, porking out on new, sweet spring grass. This means no hanging out debating and salivating over what might be served for dinner. This means, OH MY GOSH....no, no, not the 'Jenny Craig Pasture'! Some know it as "dry lot" where no grass grows. If it does, it is attacked, ripped from its precarious position and devoured in an instant. In other words --- the pasture is DIRT. But there Quaker will have a controlled diet. His breakfast will be weighed every morning and fed to just him. He won't be able to muscle in on the other guy's grub. Third comes the weight loss. It will be lonely out there but slowly, ever so slowly Quaker will become the littlest of the biggest losers. If you are a horse, it just doesn't cut it being "fluffy". Or going....... 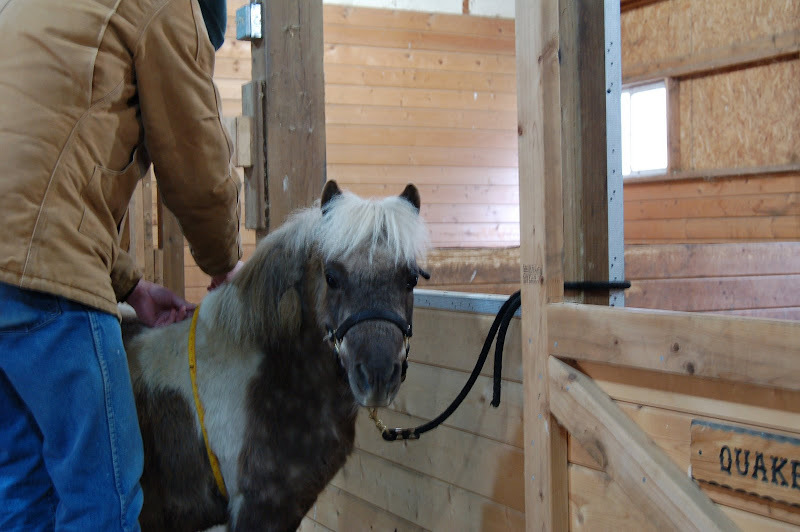 This little horse is "Mister Fancy-Pants"! No, no, that's not his real name...just what he thinks he is. His registered name is Hidden Haven's Poco Bandito. But to us, 'round the farm, he's just plain ole "Otis". Plain? Mundane? Not. From the head tossing and mane flying to the high stepping and flashy footwork, this fellow is attitude with a capital "A". And, considering his back is less than a yard off the ground, he is quite the package! Plain ole "Otis" would have liked Mr. Webster. Ahhhhhh, finally a break in the weather! That means a sunny day in the low 70's and there is work to be done in the (1 1/2 acre) yard. But seriously now. 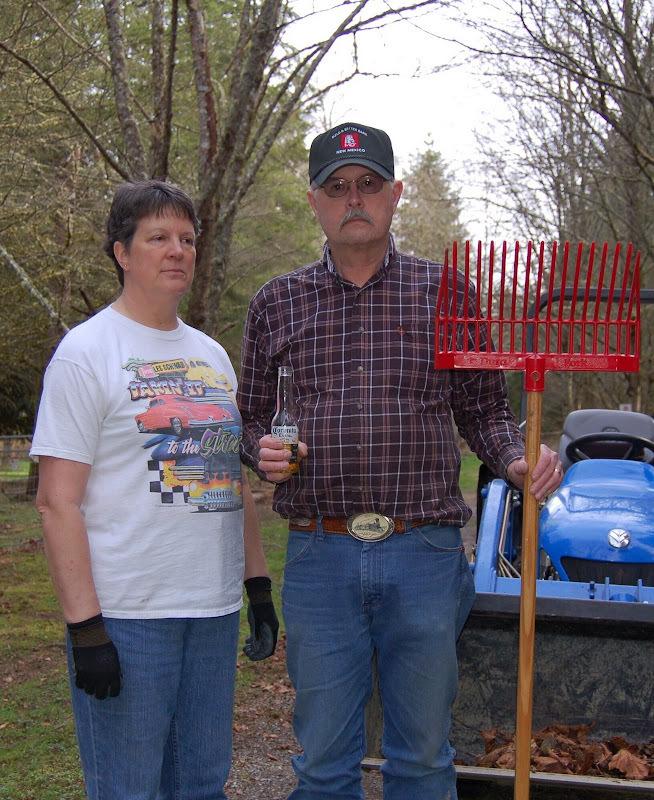 Wouldn't you hire this lovely couple to maintain your estate? You should see them when they are tired and grumpy. I'd like to blame and to thank two friends, I have never met, for this baby blog! "Never met," you say? Yup. Linda and Penni both live a good 1600 miles from me, in New Mexico. They both have wonderful blogs. They both unleashed the blogger in me! They're "keepers" for sure and they'll be neighbors some day too. That will happen when I finally...finally retire to my ranch in New Mexico. The picture above is of our place in Washington State last December (taken by daughter, Jennifer). If you look closely you can see a fuzzy donkey-belly behind one of the fences...that's "Pistol Pete". More about the critters on our place in the future. Granted, spring is here and tomorrow there will NOT be snow....but this picture was so pretty I couldn't resist. Hey there! I'd love to hear from you. You can leave a comment by scrolling to the bottom of the story and clicking on "comment". Follow the quick instructions.